In 2006 the design of a first underwater large coil metal detector was started. The engineering phase was completed in early 2007 with the production release of the equipment. The unit is a single zone EMI Metal Detector based on a bi-static Transmitter/Receiver planar antenna with an active surface area of 1150mm (W) x 900mm (L). The antenna windings are protected inside a rigid plastic housing sealed with resin and mounted to the structure of a ROV with a framework of tubing made of AISI316 Stainless Steel. This structure is calculated to be balanced underwater by the hydrostatic buoyancy of the hollow parts. The electronics unit, sealed with resin inside a 316 SS container, is connected to the antenna array by a cable suitable for operations under high pressure; a second cable with similar characteristics provides DC power to the antenna. The power is directly supplied by the ROV. The detection system is based on the transmission and receiving of a low frequency electromagnetic field and it is tuned to detect targets made of magnetic and nonmagnetic metals. 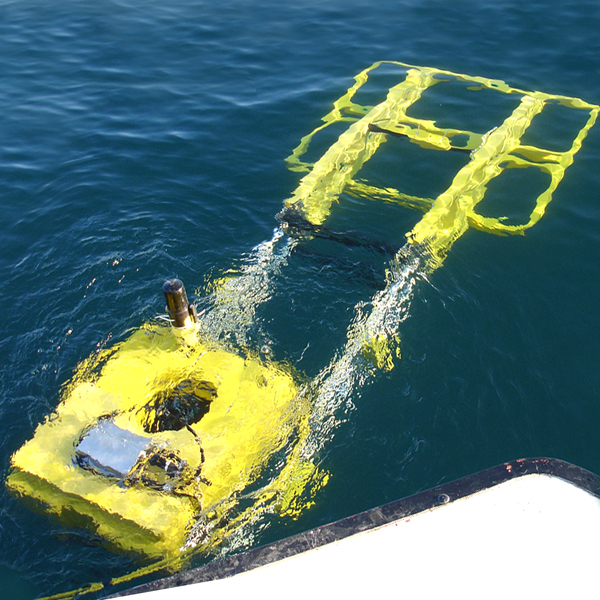 The operation of the detector can be controlled from a surface vessel connected to the ROV by a cable and assisted by a system of lights and cameras allowing to see visible objects and avoid obstacles like wood trunks and rocks.